George Bernard Shaw ranked Houdini as one of the most important persons in the world. And nearly three-quarters of a century after his death, Houdini remains synonymous with the art of magic. Houdini performed illusions and escapes throughout Europe, the United States, Russia, and Australia, notwithstanding being the highest paid performer of his era, and an aviator, a fight fan, an inventor, a writer-author, and film maker. 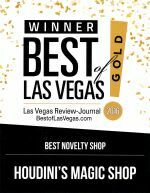 Houdini's Magic Shop offers magic tricks, gags, pranks and novelties with the theme of the late great Harry Houdini. America's first magic shop existed in New York City before the turn of the century, and magic was performed in close-up style in the bars on Broadway as far back as the mid 1700's. It became a part of New York. Even Houdini operated a Magic Shop in New York. Houdini's Magic Shop will re-create that magic. Houdini's Magic Shop instill's excitement, wonder and a touch of the mysterious. Accentuating the magic is the HOUDINI MUSEUM, at the Corporate Store, with many Houdini items, including framed and autographed pictures and letters from the legendary Harry Houdini, and even authentic Houdini handcuffs and restraint device valued in the thousands. Full size stage illusions similar to those used in his show. Many more unique and "one of a kind" items and ephemera are on display in this unique retail exhibit. Magic has been a universal art form that dates back thousands of years. It breaks all language barriers and has broad appeal to all ages and sexes. In a simple word, it is fun! Houdini's Magic Shop presents magic with a special twist - a performance with audience participation. Throughout the day, there is a free magic show for all guests and visitors. The specially scripted show is geared to capture the interest of all ages, with carefully selected magic tricks, gags and novelties having a strong family appeal.